Maroon linen pocket square with a maroon tightly serged edge and a brown horn plastic button. Ideal for weddings, the office, date night...Perfect every single day! This pocket square adds an excellent pop of color to any outfit! Never leave home without the perfect accessory tucked into your pocket. Need a custom accessory? Send us a message! All products handmade in the USA. Linen/ Plastic. 11 1/2" x 11 1/2". Ekron Pocket Square. All pocket squares are customizable- Just let us know exactly what you need! 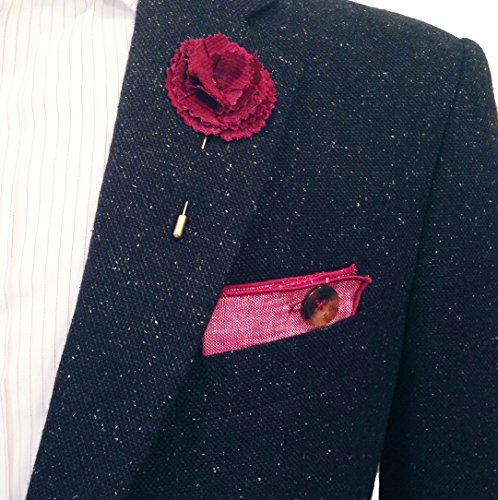 Find the lapel flower pin in the Lapel Flower Pin section of The Detailed Male. Maroon linen pocket square with a maroon tightly serged edge and a brown horn plastic button. Items are often shipped the same day the order is received. However, because all of our items are handmade, please send us a message if you need to receive your items within three days of placing your order to ensure we can accomodate your request. 11 1/2" x 11 1/2. A classic, essential versatile accessory that every man needs. If you have any questions about this product by The Detailed Male, contact us by completing and submitting the form below. If you are looking for a specif part number, please include it with your message.